Home of the New Orleans Saints for several years, Tulane Stadium was mainly known as the home of the Tulane Green Wave (NCAA) and as the home of the Sugar Bowl. In the early 1920s in recognition of the Green Wave’s achievements, 6,000 citizens donated $300,000 to construct a football stadium. Named Tulane Stadium, it opened on October 23, 1926 when Tulane played Auburn University. The stadium had a capacity of around 35,000 with stands on both sides of the gridiron. It was built on an old plantation where sugar was first granulated in the United States, thus it became the site of the Sugar Bowl. Tulane Stadium underwent many renovations during its existence. In 1937 the north end stands were added increasing the capacity by 14,000. Two years later the stadium was double decked increasing the capacity to 69,000. The final addition came in 1947 when the stadium was enlarged to seat 80,985 fans. Throughout the years improvements at the stadium included permanent seats, portal seats, scoreboards and lights. In 1966, New Orleans was awarded a NFL franchise, the Saints. The team needed a stadium to play at choosing Tulane Stadium as their home. On September 17, 1967 the Saints played their first game at Tulane Stadium against the Los Angeles Rams. By 1970 talk began about building a domed stadium near downtown New Orleans. A new stadium for the Saints, the Superdome, was constructed and built in time for the 1975 NFL season. The Saints played their last game at Tulane Stadium on December 8, 1974 against the Cardinals. The final game ever at the stadium was Super Bowl IX in January 1975. Tulane Stadium was the home of the Tulane Green Wave and the annual Sugar Bowl game for near a half a century before both were moved to the Superdome. 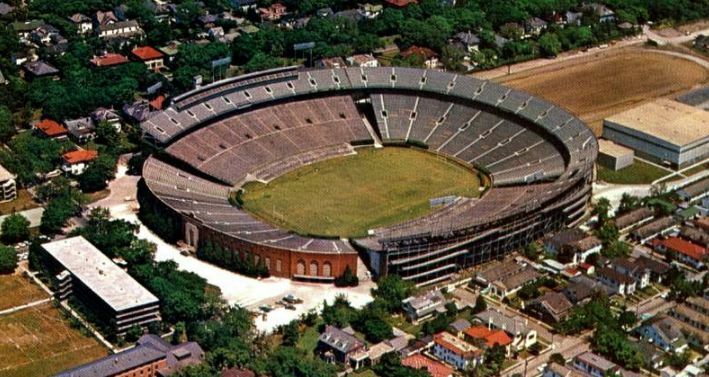 Tulane Stadium was demolished in 1980 and is now the site of a recreation and athletic center.